Plot (For the U.S. Version): WARNING! : I Tell the Endings! A Japanese fishing boat (oh no, I don't like the sound of this already) is caught in a storm and lost at sea. The ship is later found by Goro, a news reporter. He finds only one lone survivor, Ken, who claims to see something "...huge," and "...like a monster" rise out of a volcano. The rest of the crew was killed by giant lice that was on Godzilla (the "...like a monster" of course). The Prime Minister is reported that Godzilla has returned after 30 years (all the movies, except the original one was erased). He wants it to keep it a secret, so their won't be panic throughout Japan. Goro is furious that the editor won't let him publish his story, but he suggests to see Professor Hayashida, an expert on Godzilla. Goro learns that Professor Hayashida's parents were killed by Godzilla thirty years ago, and that Godzilla is a pretty much a walking nuclear weapon who is totally indestructible. Goro then meets up with Ken's sister, which he recognized from a picture Ken had given to him on the ship. The government had ordered that nobody is to tell her her brother is still alive. The words slip out of Goro's mouth when he talks to her. A Soviet nuclear submarine is destroyed by Godzilla. Since Cold War tensions were high at this time, the Russians suspect that the Americans destroyed it. The Russians then threat to start a nuclear war with America that is to be fought over Europe. The Prime Minister quickly reveals to the press that the submarine was destroyed by Godzilla, and not the Americans. The news spreads quickly and the search for Godzilla goes on. 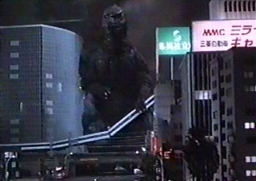 Godzilla shows up at a nuclear power plant. Hayashida and Goro take tapes of Godzilla. 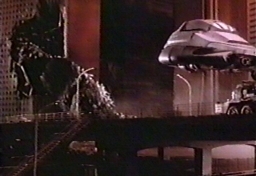 While Godzilla is absorbing some radiation from the power plant's reactor, a flock of birds flies by. Godzilla follows them back to the sea. Hayashida concludes that this could be a weakness to Godzilla and it could have some use in the future. The military begins a search for Godzilla. Then, unexpectedly, Godzilla shows up in front of a hovering helicopter with a nice big smile. Jets try to destroy Godzilla, but of course, all fails. He drops back into the ocean and shows up on the shore of Tokyo Bay. A Soviet sailor, out of panic, presses a button inside his ship that launches a nuclear missile from space towards Tokyo. The Japanese government then decides to launch the "Super-X," a heavy attack plane with titanium armor, and cadmium missiles. A virtual waste of Japanese taxpayer's money. 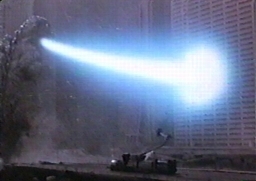 The Super-X shoots missiles in Godzilla's mouth, which knock him out. Everyone except Hayashida and Steve Martin believe Godzilla is dead. Steve Martin then complains on how it is his nap time. The Soviet missile shoots from the satellite. The Japanese then ask the Americans to fire a counter-missile towards the Soviet missile. The Americans agree and the counter-missile is successful. 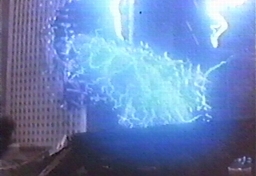 The radiation creates a storm which revives Godzilla from his deep sleep. 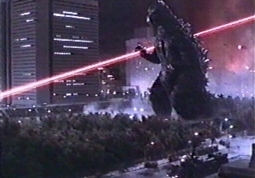 Full of vengeance, Godzilla easily destroys the Super-X. Hayashida, along with the military, travel to Mount Mihara, a volcano. There Hayashida sets up a machine that creates a bird sound. Godzilla follows and is lured into the volcano. Godzilla's threat is gone, at least for now. This movie is either very good, or very boring, depending on what kind of mood you're in. The tone is dark, like the original movie. The special effects are an improvement over the classic Godzilla films, and pretty good for the time period. As every Godzilla fan dreads, New World Pictures, the company that released this movie in the U.S., added in American actor parts. They also brought back Raymond Burr, who had played Steve Martin in the original Godzilla movie. As usual though, they spoiled the movie a little. The Pentagon officials would have the "United-States-is-much-more-superior-than-other-countries" tone of voice, and Raymond Burr looked like he wanted a steak and cheese sandwich, and go home to take a nap. 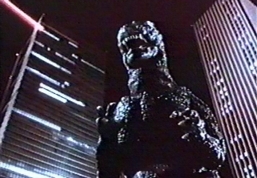 Godzilla 1985 was released in U.S. theaters exactly one month after I was born. 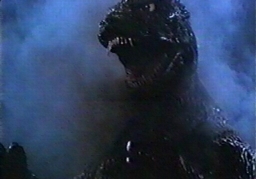 This movie launched a whole new series of Godzilla movies, later known as the Heisei Series. Every previous movie, except the original movie, was erased. Toho wanted to keep Godzilla in a serious tone, and an indestructible force of nature. They didn't want him to be the hero for children again, as he had been perceived in many of the previous movies, and which had greatly ruined his reputation. 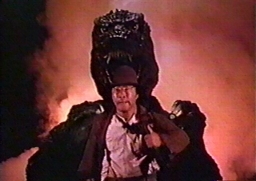 Godzilla 1985 was the last Japanese Godzilla movie shown in American theaters, before Godzilla 2000, which would be shown fifteen years later (without American actors in it thank God!). Photos above (and below) are from my own video capture.